Discover Scotland's ancient monuments, famous battlefields and legendary myths, folklore and unearthed gems on this comprehensive tour. Visit the sights of Edinburgh and Glasgow or Inverness in just 7 days on this fantastic exploration of these great cities. Our members will stay in 3* or 4* hotels with breakfast included along the way, and will be treated to a variety of incredible excursions! 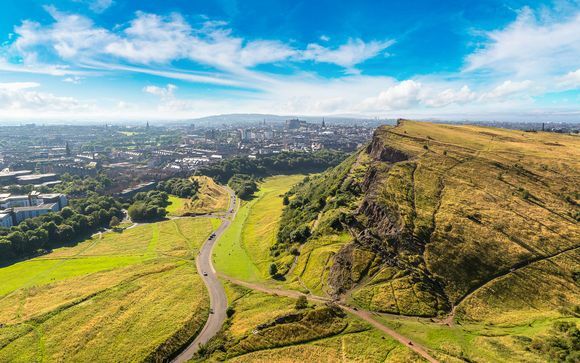 Scotland is the antithesis of traditional beach holidays; it’s a connoisseur’s country with some of the finest landscapes in the world, as well as amazing cities. The Scottish Highlands are legendary, and for good reason as it’s one of the few places where you can truly be at one with nature. Hundreds of miles of heath, mountains and more mean you can drive in any direction and enjoy the solitude of nature. You can also come face to face with rare wildlife, including Ospreys and Golden Eagles, although there’s no guarantee you’ll come across Nessie if you make the trip to the Loch! Scotland is a country steeped in tradition and the people are fiercely proud of their independence from neighbouring England, as well as their heritage. The highland games show the Scots in full flow and you might be lucky enough to see one of these events in action, where the locals come out resplendent in their traditional kilts and compete in events like hammer throws and caber tossing, as well as showing their prowess with the axe! Upon arrival, you'll go through baggage collection and find your transfer from the airport to your hotel. 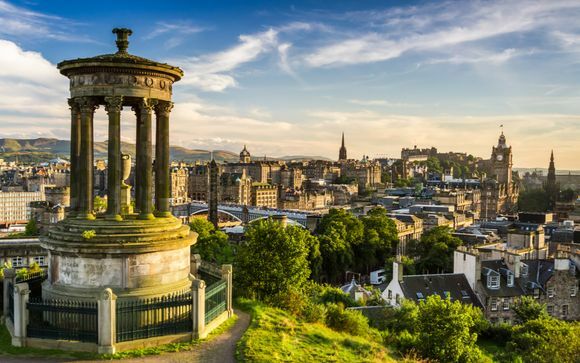 Nicknamed the Athens of the North, Edinburgh combines old and new in a uniquely Scottish atmosphere, where medieval palaces sit side by side with beautiful modern buildings. Here you will find two cities in one: the old and the new offer an amazing contrast. Old Town, a medieval gem with its maze of narrow streets, dominated by the Castle perched on its rocky peak; and New Town, the most beautiful ensemble of Georgian architecture in Europe built below in the 13th century, with its neoclassical houses… Discover the double face of the Scottish capital. THE OLD TOWN - A medieval district stretching along a ridge from the spectacular castle perched on its rocky peak to the palace of Holyrood. THE ROYAL MILE - the Main artery coming down from the Castle towards the medieval shopping district. PRINCES STREET GARDENS - Separates the Old City from the New Town. THE NEW TOWN - 18th century Georgian quarter with elegant squares and avenues: mansions with neoclassical facades contemplate large parks in the city centre. CHARLOTTE SQUARE - Place designed by Robert Adam and considered one of the finest examples of Georgian architecture in Britain, on which stands Georgian House, a symbol of elegance and testimony to the extravagant lifestyle of the rich inhabitants. HOLYROOD PALACE - The official residence of the Queen in Scotland. Located at the end of Edinburgh's Royal Mile, this Baroque palatial structure is a symbol of the rich and tumultuous history of the country. Particularly famous for having been the residence of Mary, Queen of Scots, this palace has been the setting for many dramatic events during the country's tumultuous past. NATIONAL GALLERY - This museum presents some of the finest works of Scottish portrait painters such as Allan Ramsay and Henry Raeburn. Paintings of Dutch and Flemish masters are also exhibited, as well as fine collections devoted to Italian painters: Tintoretto, Titian and Raphael. FARMERS’ MARKET (each Saturday from 09h00 to 14h00) - Located at the foot of the castle, it offers a dive into the heart of Scottish gastronomic culture and a unique opportunity to discover Scottish products (meats, cheeses, fruits and vegetables, pies and beers). ROYAL BRITANNIA BOAT - Throughout its 5 platforms, you will have an unprecedented glimpse of the royal life at sea and you will meet the shadow of the greatest passengers of this liner out of the ordinary: Sir Winston Churchill, Boris Yeltsin, Gandhi, Mandela and many others ... Most of the furniture and trinkets of state apartments are loans from the "Royal Collection". You can admire the jewels of the liner: the splendid official dining room, the Queen's room, the drawing room, the Admiral's cabin and of course the Sun Lounge. GLENKINCHIE DISTILLERY - Set amid the barley fields, far from the hustle and bustle of the Scottish capital. She prides herself on producing "Edinburgh malt". She is the only one in Scotland to be headed by a woman, Kay Fleming, and one of the last remaining Lowland distilleries. Here, the tradition has not lost any importance and the Glenkinchie distillery remains the undisputed emblem of the fresh and light style that characterizes this region. The following excursions are included in this offer. A symbol of the city that it dominates and overlooks. Often besieged, several times demolished, the citadel was a royal residence from the 11th century and served as a military garrison. 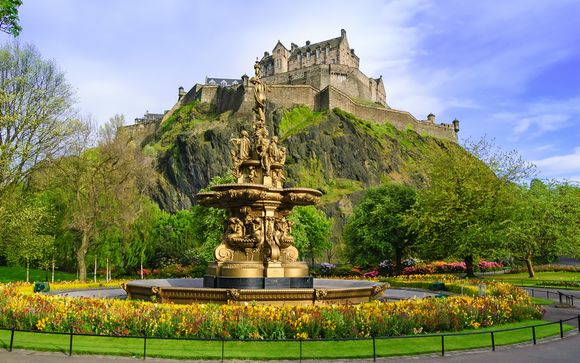 In addition to the Esplanade, where the "Military Tattoo" and the fortifications, with a superb view of "Princess Street" unfolds, you will discover the jewels of the Scottish crown "Honors of Scotland" as they are kept within it. This castle has witnessed many great moments in Scottish history. In 1140, this is where the Scottish Parliament meets for the first time. In 1566, it was in its walls that was born the son of Mary, Queen of Scotland, who later became King of Scotland and England. In 1745, the castle had its last seat when the garrison resisted Bonnie Prince Charlie. Enjoy a charming one day tour from Edinburgh at a relaxed pace, with plenty of free time to explore Scotland’s home of golf, the ancient town of St. Andrews and the fishing villages of the “Kingdom of Fife”. We leave Edinburgh, crossing the iconic Forth Bridge, into the ancient “Kingdom of Fife”. We enjoy a photo stop at Aberdour before continuing into the East Neuk of Fife. We stop in the town of Anstruther, home of the Scottish Fisheries Museum, then we travel through the villages of Pittenweem, Crail and St. Monans, once thriving fishing centres which were made prosperous by trade within the continent. We arrive in the beautiful medieval town of St. Andrews in time for lunch. Here you can enjoy a walk around the town, where Prince William met Kate, home to the oldest university in Scotland, famous Cathedral and golf course. Enjoy approximately three hours of free time to explore its medieval buildings and wonderful cobbled streets in the centre, and have lunch and refreshments. Heading homewards we travel across the Lomond hills to Falkland for a photo stop. The village was used as the setting for 1960s Inverness in the Outlander series. Then, descending to Loch Leven (scene of Mary Queen of Scot's imprisonment and escape) and on to the picturesque village of South Queensferry where we enjoy our final stop before returning to Edinburgh. Have the perfect introduction to the world of Scottish Whisky. Enjoy The Scotch Whisky Experience, a five-star visitor attraction at the top of Edinburgh's Royal Mile, where you will be inspired by this incredible creation. You now have the choice of spending the remainder of your trip in either Glasgow or Inverness. Enjoy your included breakfast at your Edinburgh hotel, before taking the train to your next location. 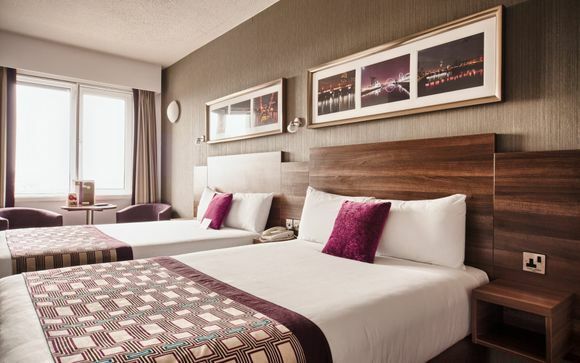 Upon arrival in Glasgow, make your way to your hotel and spend the rest of the days at leisure, exploring and taking part in your included excursions. Elected European city of architecture and design in 1999. After having flourished at the end of the 19th century, its fortunes declined in the 1960s, at the closure of its shipyards, before finding a new boom. The architecture bears witness to this history: Georgian classical facades, Baroque palaces of the Victorian era, modernist wonders, futuristic buildings ... Discover this amazing city, mixing tradition and modernism. 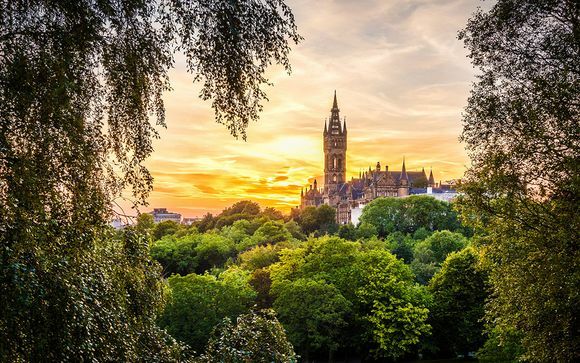 KELVINGROVE MUSEUM AND ART GALLERY - This beautiful museum and art gallery contains some of the UK’s best examples of British and European Art. GLASGOW CATHEDRAL - The present building was consecrated in 1197. Since that same period the Cathedral has never been unroofed and the worship of God has been carried out within its walls for more than 800 years. BOTANIC GARDENS – The Botanic Gardens is internationally renowned for its impressive glass houses and extensive tropical and temperate plant collections from around the world. GLASGOW CITY CHAMBERS AND GEORGE SQUARE – Glasgow City Chambers is situated on the Eastern side of George Square and is arguably one of Glasgow’s most beautiful buildings. It was built in the late 1800’s and externally is an interpretation of Renaissance Classicism incorporating Italianate designs. GLASGOW GREEN – The Peoples Palace & Winter Gardens. Glasgow Green is Glasgow’s largest park at 129 acres and has been the location of many events over the last 300 years. Situated in the Green is the recently restored Winter Gardens with its exotic palms and plants and the Peoples Palace, telling the story of the people and city from 1750. Leaving our departure city we head towards Loch Lomond (the largest expanse of fresh water in the country) where we stop off at the conservation village of Luss for coffee and sightseeing. We then head deep into the Highlands, passing through breathtaking scenery (including views along Loch Awe, the longest in Scotland). The countryside here is rich in history. We pass haunting Kilchurn Castle (historically a stronghold of the Campbell Clan) and the Pass of Brander (where Robert the Bruce had a notable victory). 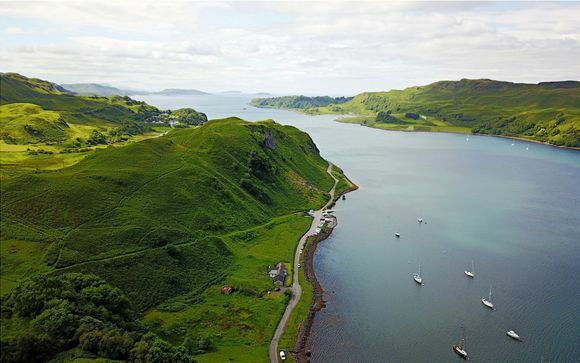 By lunchtime, you'll have reached Oban and will have time to explore this Victorian seaside town, climb up to McCaig's Tower, take in the views to the isles of Mull and Kerrera and try some of the freshest seafood you'll ever have tasted. On the way back to Edinburgh, you'll visit the seat of the Campbell Clan at Inveraray, where we'll stop so that you can enjoy ice-cream, homemade sweets, cakes and coffee and drink in the beauty of Loch Fyne. Discover all the best sights and attractions of this incredible city in a day. On this hop on hop off pass, you have the freedom to pick and choose where, and when you want to go. Enjoy your included breakfast at your Edinburgh hotel, before taking the train to your next location. 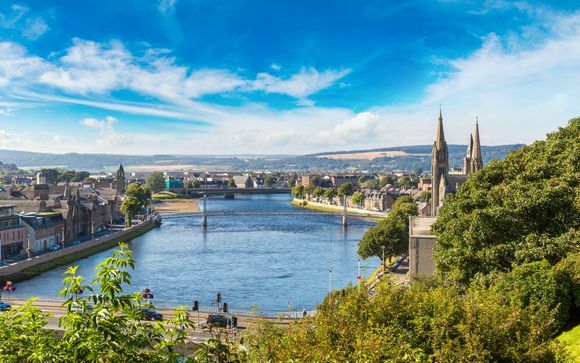 Upon arrival in Inverness, make your way to your hotel and spend the rest of the days at leisure, exploring and taking part in your included excursions. INVERNESS CASTLE - This 1800s red sandstone castle sits on a cliff overlooking the River Ness & offers lush grounds open to the public. INVERNESS CATHEDRAL - This beautiful Victorian Episcopalian cathedral church, built of red stone and granite, hosts regular services and is open every day for visitors and prayer. CALEDONIAN CANAL - Considered to be one of the most impressive waterways in the world, the 100 km Caledonian Canal begins in Inverness, running all the way across the Great Glen. Designed in the 19th century by Thomas Telford, today the canal is a Scheduled Ancient Monument. Explore the towpaths on foot or by bicycle. EDEN COURT THEATRE - A piece of contemporary architecture, opened in the 1970s, features two Grade A Listed theatre spaces, as well as another theatre, two cinemas, drama and dance studios, and dressing rooms. GLEN ORD DISTILLERY - This distillery, which originated in the mid-19th century, is just a short bus ride from Inverness. Book a tasting tour, where you can learn all about the process of making Glen Ord’s signature malt whisky, for which they malt their own barley, and taste various aged varieties. DOLPHIN WATCHING - The Dolphin and Seal Centre in North Kessock is worth a visit for its excellent Bottle-nose Dolphin watching opportunities. Just a short bus from the city centre, you will be in one of the best locations for watching these creatures. THE SITE OF CULLODEN’S BATTLE - Which changed the course of British, European and world history. Stones and monuments locate the tombs used as memorials, while trails mark the frontlines of the opponents. CAWDOR’S CASTLE - Considered to be one of the most beautiful historic houses in Scotland: its medieval tower and drawbridge are in perfect condition and you can discover an extensive collection of paintings, tapestries, furniture and books... Few Scottish castles have such beautiful gardens: its walled garden, the oldest (created in 1620) served as a kitchen garden to the castle. Cruise the Loch, visit a castle, and experience the legend on this guided coach tour and cruise that transports you from Inverness city centre to the myths, history and spectacular views of Loch Ness. Learn everything there is to know about the home of Nessie as you roll along her shores. Then get your camera ready for a 30-minute cruise on the world-famous waters, complete with an onboard audio guide to fuel your imagination with unbelievable stories from the Great Glen’s turbulent past. 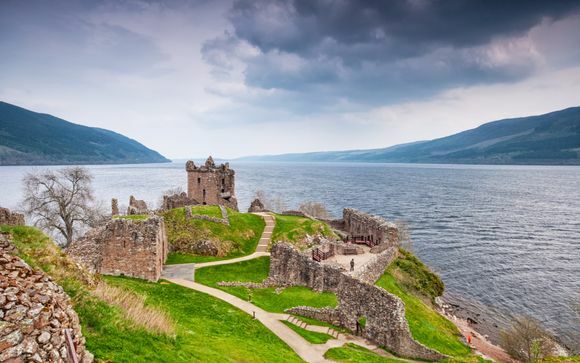 What’s more, you’ll have a fascinating hour to have a nosy around the once mighty stronghold of Urquhart Castle, as well as a trip to the Loch Ness Monster Exhibition – all entry fees included. Discover all the best sights and attractions of this fantastic city in a day. On this hop on hop off pass, you have the freedom to pick and choose where, and when you want to go. Please Note: Your day to day itinerary may vary. You will stay at the following 3* Hotels or 4* Hotels, in Standard Rooms with daily Breakfast included. Transfers: Return Transfer from Edinburgh Airport are included. Return train tickets from Edinburgh to either Glasgow or Inverness are included. Your contract will be with Voyage Privé. The air holiday package(s) shown are ATOL protected by the Civil Aviation Authority. Our ATOL number is 10170. Please do make sure that you either add Voyage Privé to your Safe Senders list or check your Junk mail regularly for your travel documents.